The Océ Plotwave 750 is a mid-volume black and white large format printer that can enable you to exceed the limits of your devices’ capabilities. The Océ PlotWave 750 wide format printing system helps you meet the complex document challenges faced in a departmental print setting or a productive, central print room environment. 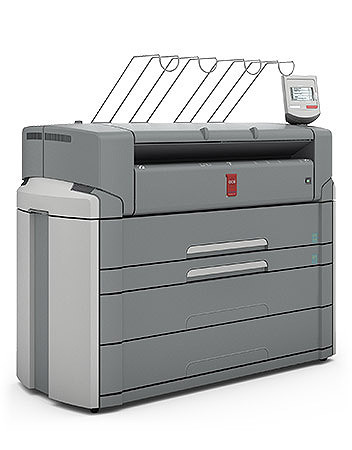 Mid-to-high demand technical document printing, scanning & copying system. Advanced networking and security. Windows® Embedded Standard 7 (WES7) controller. Eco-design–lowest energy usage, noise level, and ozone emission in its class. 9 D-size prints per minute with no waiting, thanks to Océ’s Radiant Fusing technology. Expandable from 2 rolls to 6 media rolls for over 10,000 sq. ft. of uninterrupted printing. Multiple scanner and finishing options for stacking/folding of technical documents.